Happy New Year to all! As you read this, snow is stacking up in the mountains and a blanket of white has covered the valleys. The fishing may have slowed down during this period but a lot is going on to prepare for the upcoming 2019 season. Be sure to check out the blog article on the Madison River NRC about changes that are happening. We have been restocking the fly boxes, taking bookings for 2019 and stoking the fire. The phone has been ringing quite a bit more than in past years for early bookings, and we are excited about filling up the calendar. If a fishing trip is in your plan this year, I urge you to contact us soon about available dates. We are not the largest outfitter in the area, and our best and most experienced guides get booked first. Check out our blog article on how the booking system works. As we patiently await the upcoming season, we are here to answer your calls and emails. 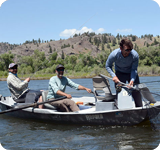 If you have any questions about our trips, seasons, what flies to use, or what to expect when fishing Montana, give us a call or email and we will be glad to discuss any topics in detail. Hope to hear from you soon. Call 866-456-6889. 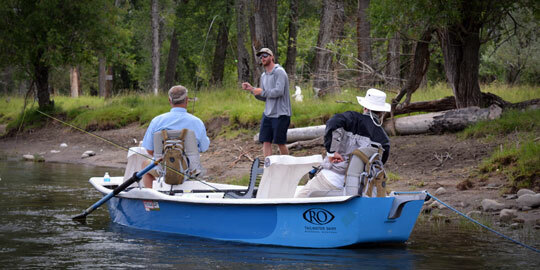 Montana Trout Wranglers believes that your trip should be a special trip. We don't have 20 guides on staff. We aren't the biggest outfitter in the area. However, we choose quality over quantity. IS THE MADISON RIVER IN JEOPARDY? 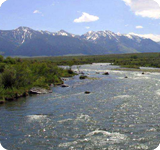 The Madison River is one of Montana's most iconic rivers. Many books, magazine articles and videos have been the focus of this famous river. It draws people all over the world to come and wade its waters or float the river though the scenic Madison River Valley. This month's three flies are all general attractors for fishing in Southwestern Montana. They are not new flies. In fact, they have been around for a long time. You will find them in every guides' boxes because they are so dependable for our waters. The first fly is the Prince nymph. Developed in the 1930s by Doug Prince, this fly has been around a very long time. It is more popular in Montana to have a bead attached to the front of the fly, either brass or tungsten. This pattern isn't specific to any hatches but could be considered some sort of stonefly. 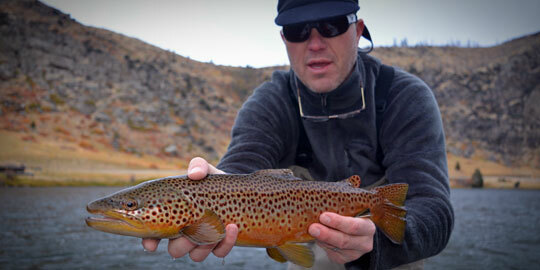 We fish this pattern both deep under an indicator or shorter under a dry fly. It comes in many different hook sizes, from size 4-18. There are many different variations of this fly that incorporate different materials. Some are flashy and some are tied in different colors. The original Adams dry fly was invented in the 1920s in Michigan. The parachute Adams came along in the mid 1930s and was invented both in Scotland and America at around the same time. This is probably one of the most popular dry flies in Montana, if not the world. Tied in a variety of sizes, it can represent a multitude of mayflies. It floats low on the water but is very visible with the white post. The lightning bug is a much newer invention, but I believe it will be around for quite some time. It is said to be invented in the early 1990s around Washington State's waters. I first saw this fly in Montana in the late 1990s. Since it's introduction, it has been a staple in my fly box. It can be tied in various colors using different colored flash. Besides the original silver lightning bug some of my favorites are gold and purple. This is a great picture of going above and beyond. Paul and I were working together and we had a quick but very complete lesson before we launched our boats with new inexperienced clients in the morning. We threw a lot of instruction out and they seemed to take it all in. 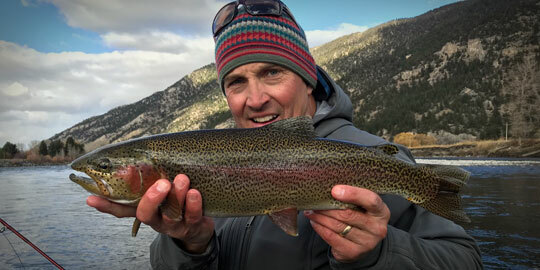 We set out to have a great day and about 20 minutes into our day, Paul realized that his clients hadn't quite grasp the task of fighting fish after losing a few in a short amount of time. He then rowed over to the bank, gave some more instruction on how to fight fish and put them in the net, and the clients were very receptive. 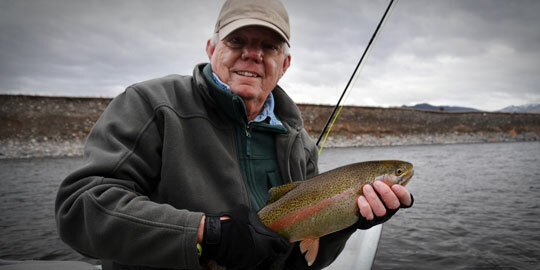 Instead of just rowing down the river and having his clients for the day keep making the same mistakes, he wanted to touch on the finer points of fighting wild trout knowing that it would pay dividends at the end of the day. In the end, everyone had a great day. They landed quite a few, lost a few, and had lots of laughs. I was proud to see Paul make the extra effort to ensure an enjoyable day for his clients.